Held each year, the Prince Michael International Road Safety Awards recognise improvements in road safety in Britain. Over 300 guests attended the ceremony held at The Savoy, London. The Prince’s speech emphasised the significance of bringing together agencies and partnerships to achieve successful intervention. The judges felt that our work on improving load security was a fine example of enforcement that included education based on solid research. In 2014, Highways England reported 325 incidents of vehicles shedding their loads with an average lane impact of 86 minutes. 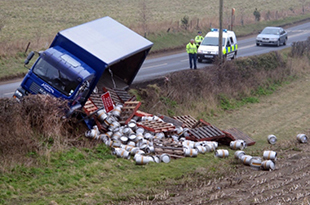 We worked with experts including; haulage companies, the police and Highways England to produce a quality guide that would reduce dangerous incidents. The working group allowed us to work with the haulage industry to help them produce specific load security guides for their own industry. Various guides were then produced for industries such as drinks, steel, aggregates and timber. Members included DVSA, Health and Safety Laboratory (HSL), the police, trade associations, the confederation of industry, vehicle manufactures, and HSE (Health and Safety Executive). What’s in the load securing guide? We chose subjects based on the things causing greatest concern to industry, as well as those of primary concern for all road users. We included a comprehensive explanation of DVSA’s approach to load securing and industry specific guidance for a broad range of sectors. These include general haulage operators and others involved in the transport and supply chain industry. 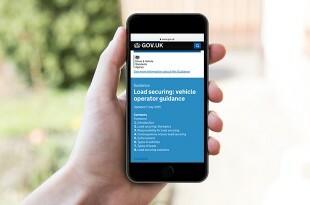 The 8-part guide includes sections on the responsibilities of those in the transport industry as well as the consequences of poor load securing. We also included several high-quality videos to help make it easier to understand best loading practice, general responsibilities and how DVSA assess how loads are secured. The guide also complements existing Department for Transport (DfT) guidance and the European Commission (EC) code of practice which provides detailed guidance on the current approach to enforcement. We’ve also been providing extra training to DVSA examiners on load security. Examiners are now able to give better education and advice to drivers on how to safely load their vehicle in future. The training also helps examiners to better judge the seriousness of the load stability and security. Alongside this, in partnership with the HSL and the trade bodies, we produced a load security matrix to give a consistent approach to load security. The matrix, now being used by examiners, shows the action to take at the roadside when there are issues with the load security. It’s been published in the trade press and GOV.UK.